Mistah Metro of Prospect Heights' Red Legged Devils posted a photo of his apparently tattooed dog. BROOKLYN — A Prospect Heights tattoo artist who bragged about inking his passed-out pooch has lost his job, his boss said Thursday. "I don't condone animal abuse," said Chris Torres, the owner of the tattoo shop Red Legged Devils. "This has gone viral. It's not good." The dog's owner, a tattoo artist identified only as Alex, sparked widespread outrage after posting a shot of his work on Instagram Wednesday, according to reports. 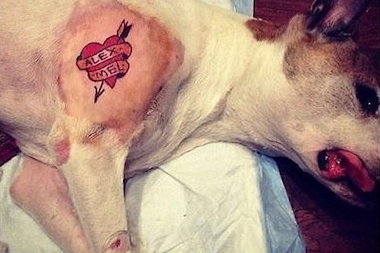 The photo shows the dog with a shaved right shoulder emblazoned with an arrow-pierced heart wrapped in a ribbon that reads "Alex" and "Mel." "One of the many reasons my dog is cooler than yours!" Alex, who goes by Mistah Metro online, captioned the Instagram photo, Gothamist reported. "She had her spleen removed today and the vet let me tattoo her while she was under," he added. Reactions that spread across social media were quick and angry. "@MistaMetro7 F--- YOU! YOU DESERVE TO DIE YOU PIECE OF S---. GO TO HELL," Krista Leann tweeted followed by a link to the photo. "how does a vet let u tattoo ur dog while still under anesthesia?? Pic is either edited or you're sick & shouldn't have a dog!" tweeted @MTLCanadiensTV. Mistah Metro's social media accounts were all either suspended or locked by Thursday morning. Torres, who founded Red Legged Devils tattoo shop at 229 Flatbush Ave., has appeared on TLC's reality show "NY Ink." Torres said Thursday that he hadn't seen Alex since he left to apply the tattoo. He defended his former employee as an animal lover. "He's a nice kid. It obviously wasn't well thought out," Torres said. "He spent thousands and thousands on the dog to keep him in good health. He cared for it like an old person in an old home." Still, considering the negative attention the incident has brought to his shop, Torres said Alex could not come back to work. "People are attacking me, but it happened at a vet," Torres said. "Who am I to question a vet and say double check with another vet again?"